Sure, we’re in the bone-cold middle of January, but who says you can’t daydream about spring and summer? Why not keep the winter blues away by working with your unit to plan a tree planting project for this spring or summer. Bonus! 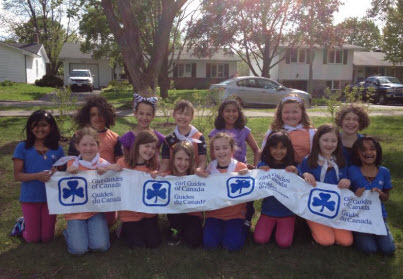 We’ve made some great updates to the Girl Guides of Canada tree planting program grant program. Last spring, three large ash trees, infected with the emerald ash borer, were removed from the school yard. Re-planting was a great idea, we all agreed. I went ahead and looked into the TD Tree Planting Grant that I’d noticed posted on the GGC website. I shot off an email, filled out the application and a couple of months later we found out that we had a tree planting grant! To be honest, I didn’t give it too much thought after that until about a month before those trees were supposed to go in. I met with the school principal, the school board’s tree consultant and the school custodian. What I learned is that $500 doesn’t buy a lot of trees. In fact, it would probably buy one or two trees and the trees would be too heavy for the girls to actually plant themselves so we’d have to hire a company to come and dig the hole and put the tree in the ground. The girls could mulch and water it. This was not what I had in mind. I wanted my Brownies to get their hands dirty. I wanted them wielding shovels and wearing rubber boots. I wanted them to sweat. I wanted them to have ownership of this project. This had to be more than a photo-opp for these girls. We opted for the tree consultant’s alternative plan: we wouldn’t try and replace our lost ash trees. Instead, we’d plant a grove of serviceberry trees that would provide some privacy from the road, lots of educational opportunities when the butterflies and birds found the berries, and hopefully the ability for the kids at the school to pick, cook and eat the berries from these trees. Time was marching on. The tree planting was two weeks away and I didn’t have trees or a garden centre that would cut me a deal so that each of our 17 Brownies could put a tree in the ground. It was time to meet some people. I went to a family-owned garden centre a stone’s throw away from the school. I talked at length to Mr. Best-Garden-Centre-Manager-on-Earth and told him what I wanted to do and what I wanted my Brownies to experience. “I want them to get their hands dirty,” I said. “I want them to have ownership of this so they can each come back in 20 years and say – that’s my tree.” He nodded. He made a phone call and told me to come back in a week. “We’ll work it out,” he said. I had to put my trust in this guy, during his busiest time of the year, that there would be trees there for me to pick up, at a price I could afford, twelve hours before the trees had to go in the ground. A week later I returned to the garden centre. Mr Best Guy said he remembered me and yes, he had the trees. He had twenty 3-gallon serviceberries and he was glad I came in because he couldn’t remember why he’d ordered so many. (I’m sure glad no one else came in looking for any! Phew!). He charged me $550 for 17 trees and 10 bags of soil. He wished us luck, gave me a squeeze and sent me on my way, my Mazda 5 stuffed with 17 trees. I drove with my hazards on, and tree branches sticking out every orifice of my car. The next day, each of my Brownies got their hands dirty, as did their parents. They dug and they grunted and they sweated and they watered and they got rained on and muddy and they laughed and laughed and laughed. On Monday at our meeting, the first thing each of them did was run over to “their” tree to see how it was doing. “That’s mine!” they each shouted. Our tree planting was probably the most work I had to put into any one Guiding project this year. It was stressful and time-consuming and kept me up for a few nights worrying if it would all work out. And it was the best Guiding project I did this year. Because every Brownie who was there will remember this for years to come. They learned why people fall in love with digging in the earth. They learned the joy of getting dirty and wearing rubber boots and sweating. They learned they are strong and can do hard things and can make a significant contribution to their community. In one day. In one hour. Thank you to TD Foundation for helping teach them that. Thank you to Artistic Landscape Design in Ottawa for making our money go so far. By guest blogger and Guider Karen. This entry was posted in Awesome Activities and tagged environment, meeting ideas, TD Friends of the Environment, TD Tree Day, td tree planting grant. Bookmark the permalink. We did our td tree day at the beginning of the year.